I was working at an ISP back in the days. One day we decided to create a platform for customer to host VPS (Virtual Private Servers). 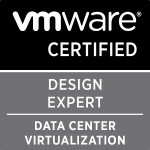 I did the VI3.5 course and obtained the VCP3 certification. So that project was actually my first experience with VMware. After that, I was pretty much hooked and became an instant fan of virtualization and VMware in specific! Well, I actually took almost half a year ‘off’ between getting both VCAP’s and beginning with my VCDX application. So I guess, all in all, it took me a year after deciding I wanted to give it a shot. I would like to say to them to take all the known VCDX clichés into account, but do pave your own path to VCDX. Believe in your own approach to actually apply for it. Do not get ‘scared’ of by some of the stories dwelling around on the internet. If you have questions about VCDX, reach out to a mentor / current holder. Another important one; set realistic targets for yourself and stick to it! Not that much I guess… Knowing what I know now (having experienced an actual defense), I would have definitely gone for it earlier on that I did. So life does go on, but it was definitely worth it!! Although the VCDX track is there to verify you as an architect, I did learn a lot during my journey. All in all, it made me a better architect than I was before. My employer, my customers and people around me were over the moon with the result, as was I. It was also very cool to see all the good vibes from the VMware community on me passing the defense! It is a little bit harder to explain what VCDX beholds to people not familiar with it, but the part that it still is a very exclusive certification to have is very well received and instantly respected.